To give you an idea of the nature of our Sacred Travel and Pilgrimages, please enjoy some details, flyers, itineraries of past trips. I feel that any of these would be representative of the experience you would have on any upcoming journey with me, to any locale. 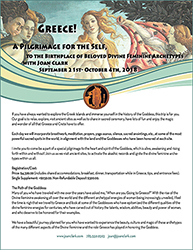 If you have always wanted to explore the Greek Islands and immerse yourself in the history of the Goddess, this trip is for you. This trip also doubles as this year’s Annual Moon Goddedss Retreat! Our goal is to relax, explore, visit ancient sites as well as to share in sacred ceremony, have lots of fun and enjoy the magic and wonder of all that Greece and Crete have to offer. I invite you to come be a part of a special pilgrimage to the heart and spirit of the Goddess, which is alive, awakening and rising forth within and without! Join us as we visit ancient sites, to activate the akashic records and ignite the divine feminine archetypes within us all. Many of you who have traveled with me over the years have asked me, “When are you Going to Greece?” With the rise of the Divine Feminine awakening all over the world and the different archetypal energies of woman being increasingly unveiled, I feel the time is nigh that we travel to Greece and look at some of the Goddesses who have epitomized the different qualities of the divine feminine energies for centuries; who have carved out of history the talents, wisdom, abilities, beauty and power of woman; and who deserve to be honored for their examples. For more information and itinerary please Download full-color flyer. Awakening the Medicine Woman Within! 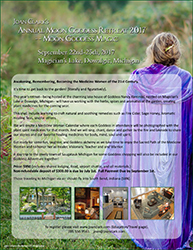 To be hosted at the charming lake house of Goddess Nancy Kaminski nestled on Magician’s Lake in Dowalgic, Michigan. It’s time to get back to the garden! (literally and figuratively). This year’s retreat will have us working with the herbs, spices and aromatics of the garden, creating plant medicines for the coming year. This might include learning to craft natural and soothing remedies such as Fire Cider, Sage Honey, Aromatic Healing Teas, and more. We will create a Medicine Woman Calendar where each Goddess in attendance will be photographed with the plant spirit medicines for that month. And we will sing, chant, and gather by the fire to share our stories and our favorite healing medicines for body, mind, soul and spirit. Get ready for some fun, laughter, and Goddess alchemy as we take time to enjoy the Sacred Path of the Medicine Woman and to honor her as Healer, Visionary, Teacher and Warrior. Price: $950 (includes lodging, food, airport shuttle, and all materials). Scotland is a land full of ancient wisdom and magic. From Rosslyn Chapel to the elusive Isle of Skye and the Holy Island of Iona we will immerse ourselves in the alchemy of this sacred earth and breathe in all that it has to offer us on our own individual and collective pilgrimage. Here we take a deeper look at honoring the path of the Goddess with Mary Magdalene as our inner guide and teacher. This is a pilgrimage, not a tour. It is a spiritual journey for those who are being called to awaken, ascend or simply listen to the voice within. There will be individual, as well as group rituals, gatherings and ceremonies, in which it will be important for everyone to participate. We will work with the Goddess Mystery School Teachings of Mary Magdalene and the sacred alchemy of scent and fragrance that has been used in temples and holy gatherings for centuries. Download a full-color flyer, complete with itinerary and all information. 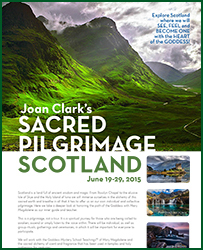 Several years ago, during a pilgrimage to France, Joan Clark received seven sacred teachings from Mary Magdalene. With those teachings, Joan was inspired to create the curriculum for her Goddess Mystery School. Mary Magdalene’s seven sacred Goddess Mystery School teachings of: * Humility,* Forgiveness, * Compassion, * Trust, * Love, * Ecstatic Joy and * Oneness will be the cornerstones of our May 2014 Sacred Pilgrimage to France. We will work with one specific teaching at each of the primary sites to be visited, to gain a more intimate, heart-felt understanding of what they mean – individually and collectively – at this very moment in our lives. At each site there is something awaiting you. If you feel the call, please come. Reserve your place in this powerful circle. I can personally attest that it will be a transformative experience. This trip is framed as a spiritual pilgrimage– a soul-calling to increase intention and devotion, in the name of healing and service, by way of deep, sometimes intense, spiritual work. Those looking for a recreational tour are encouraged to enjoy France by other means. Delight the senses. Satisfy the soul. A deeper Goddess experience. This year the Goddess has called us to Bali-an exquisite land of beauty, aromatic rituals, ancient ceremonies and sacred temples. The Goddess is waiting to Welcome You. 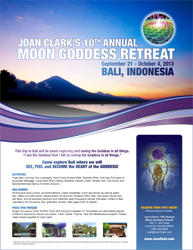 Be, Receive, Become the more fully awakened Goddess that you are as you spend 14 glorious days in Bali, immersed in a retreat designed to pamper, nurture and inspire your own Goddess essence. Ride an Elephant, meditate with dolphins, swim under a waterfall, be part of a sacred fire dance ritual and chant with the holy elders in ancient temples. Allow yourself to share your own Goddess gifts, talents and abilities with each other, as we travel across Bali creating our own aromatic rituals. Our journey in Bali has been consciously and lovingly designed with the help of Anthony and Mary McGrath. With over 15 years of Bali experience, they will joyfully share their love and knowledge of the land, people and customs, taking us to many of their most beloved sacred places. They will also provide ongoing support. It’s going to be an adventure with memories that will last a lifetime.